Mouse anti Chicken CD146 c264. 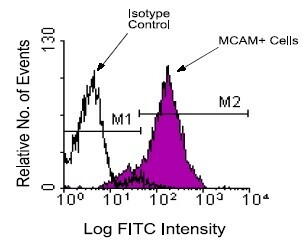 Product is tested for Frozen Sections, Immunoprecipitation, Flow Cytometry. Pooled Ed15 and Ed16 thymocytes from H.B15, H.B19 and H.B21 chicken embryos. 100 mM Borate Buffered Saline, pH 8.2. 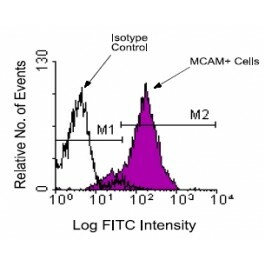 This antibody recognizes Chicken MCAM, Mr 98 kDa (protein core ~84 kDa).